Daughter of Claude Alacoque and Philiberte Lamyn, Margaret was born on July 22, at L'Hautecour, Burgundy, France, was sent to the Poor Clares school at Charolles on the death of her father, a notary, when she was eight years old. She was bedridden for five years with rheumatic fever until she was fifteen and early developed a devotion to the Blessed Sacrament. She refused marriage, and in 1671 she entered the Visitation convent at Paray-le-Monial and was professed the next year. From the time she was twenty, she experienced visions of Christ, and on December 27, 1673, she began a series of revelations that were to continue over the next year and a half. In them Christ informed her that she was His chosen instrument to spread devotion to His Sacred Heart, instructed her in a devotion that was to become known as the Nine Fridays and the Holy Hour, and asked that the feast of the Sacred Heart be established. Rebuffed by her superior, Mother de Saumaise, in her efforts to follow the instruction she had received in the visions, she eventually won her over but was unable to convince a group of theologians of the validity of her apparitions, nor was she any more successful with many of the members of her community. 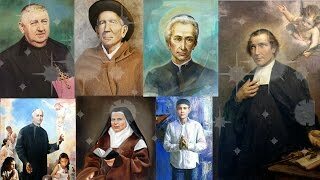 She received the support of Blessed Claude La Colombiere, the community's confessor for a time, who declared that the visions were genuine. In 1683, opposition in the community ended when Mother Melin was elected Superior and named Margaret Mary her assistant. She later became Novice Mistress, saw the convent observe the feast of the Sacred Heart privately beginning in 1686, and two years later, a chapel was built at the Paray-le-Monial to honor the Sacred Heart; soon observation of the feast of the Sacred Heart spread to other Visitation convents. Margaret Mary died at the Paray-le-Monial on October 17, and was canonized in 1920. She, St. John Eudes, and Blessed Claude La Colombiere are called the "Saints of the Sacred Heart"; the devotion was officially recognized and approved by Pope Clement XIII in 1765, seventy-five years after her death. Her feast day is observed on October 17.